Put differently, if the exportable sector requires relatively more cash, then the MRS [= (1 + [delta])q] is less than the relative price q, which implies that there is an excessive consumption of importables. When trade protection is provided only to the importable sector, the proportional change in price of exportables is zero and the proportional change in price of nontradeables is less than that of importables (with the shift parameter being less than one). 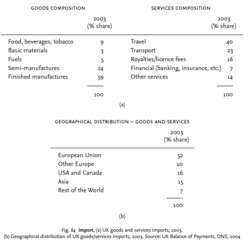 The negative impact on importables should have been even more severe and the benefits to exportables more modest. Also, if wages in the importable sector were reduced, and assuming a sufficient degree of labor mobility, workers would react to a relative wage difference by moving into the nontradable sector, thereby depressing the level of wages there and placing a downward pressure on the nontradables price. To see why, note that a zone can increase or reduce the domestic demand for importables as income rises or falls. From standard properties of the expenditure and GDP functions, we know that the Hicksian demand functions for importable goods are [e.
If all factors of production had been included (and the factor intensity of importables and imports can be assumed to be identical), net trade in the factors weighted by their factor prices ought to differ from zero only by the size of the current account surplus. It is important to point out that the extent of the effect on the equilibrium real exchange rate would depend on whether more of capital inflows are spent on non-tradables as against importables or vice versa. Interestingly, we find that if the consumption of the exportable commodity requires larger cash balances than the consumption of the importable, then contrary to standard results, an import quota may promote national welfare. The effects of import quotas on national welfare: does money matter? This is due to the fact that an increase in the tariff rate will lead to substitution away from importables and towards the non-tradable commodities creating a current account surplus and, thus, causing an appreciation of the real exchange rate. What determines the behaviour of real exchange rate in Pakistan? To capture the realistic features of the economy KW divide the economy into a non-traded goods sector and two traded goods sectors; namely, exportable and importable.